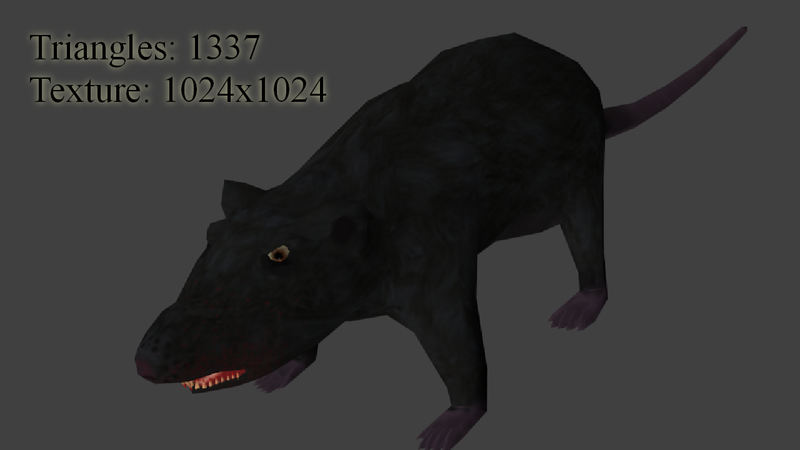 A rat that should be used in a game, I made it for my own Fantasy RPG: Rydion. It took a week to model and texture from scratch. This is a must-have in any RPG :). Thank you. Textures should be power of two, even if most modern hardware can handle it, its more efficient and prevents crashes. But just a quarter of the map is actually used, this would fit on a 512x512 map. Sorry about that, I set the dimensions to 1024 in blender but it somehow changed it to 1035! Thanks for all the comments! Nice, but this would look much more rat if it had rat-teeth. Oh my god yes! I'll change it now!